Shipstern Bluff (also known as Devil's Point or simply 'Shippies') is a globally-renowned big wave surfing location on the south eastern coast of Tasmania, Australia, on the Tasman Peninsula. Shipstern Bluff is located in the Tasman National Park, Tasmania, between Cape Raoul and Tunnel Bay. It is approximately a 30 km boat/jet ski ride from the coast to the Bluff and is regarded amongst the surfing community as one of the wildest and most dangerous locations in the world, both for the surf and the prevalence of great white sharks. The wave is also well known for its multi-faceted inner formations, referred to by many of its surfers as steps, which give the wave a unique appearance and greatly adds to the challenge of surfing it. It is known to hold and break from 1 metre to plus in winter. 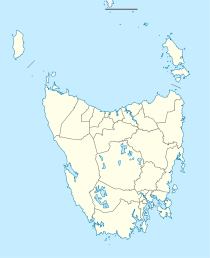 ^ "Parks & Wildlife Service - Map of Tasman National Park". Parks.tas.gov.au. 2008-09-15. Retrieved 2011-01-12. ^ a b Doherty, Sean (2007-12-18). "Places to surf before you die: Shipsterns Bluff". News.com.au. Retrieved 2011-01-12. ^ "Tasmania's Shipstern Bluff attracts daredevil surfers with lure of massive waves and worldwide fame". Abc.net.au. Retrieved 4 October 2017. ^ Shaun Wallbank (April 17, 2010). "Kelly Slater surfs Shipstern". The Mercury. Retrieved 2011-01-12. ^ Peter Wilmoth (13 March 2005). "When the green room is your stage". The Sun Herald. Retrieved 2011-01-12. ^ Peter Wilmoth (July 9, 2006). "Conquering the monster". The Age. Retrieved 2011-01-12. ^ "Mick Fanning tackles a new type of monster at Shipstern Bluff". 9news.com.au. Retrieved 4 October 2017. ^ "Biggest, Most Dangerous Shipsterns Bluff EVER? - GrindTV.com". Surf.transworld.net. 22 October 2009. Retrieved 4 October 2017. This page was last edited on 27 November 2018, at 10:43 (UTC).